This is a kitchen rule whenever you want to clean any appliance. Generally, it is important to give your coffee maker machine a good rinse using hot and soapy water especially after every use. If your coffee maker is used regularly, then you don’t need to rinse it before use especially if you wash it thoroughly after every use. The rinsing doesn’t have to be in-depth but should be able to remove all previous coffee grind residues. Although you will be cleaning your coffee maker machine every time after use, it is also good to plan for a thorough cleaning often to get rid of any grease. If you are using a traditional coffee machine, it is important to do a deep cleaning every 6 months. If you are using an espresso machine, then you should clean it more frequently with once a week being ideal. Espresso machines come with different components likely to encourage fast accumulation of dirt and grime thus necessitating the frequent cleaning. There are various coffee maker washing equipments including brushes and these will come in handy whenever you want to clean yours. These are designed to help you do a thorough cleaning and also do it faster. You can buy a few cleaning brushes for espresso machine and these will help you save time and energy. Always look for a brush which has a solid 90-degree angle to help you reach different parts of the machine. You can use distilled or white vinegar to clean your coffee maker. This will help eliminate any accumulation of minerals from hard water. You should add the right ratio of vinegar to water (for every 20 oz. of water, put 3 oz. of vinegar) and run the mixture through the machine for a few minutes. Rinse with fresh water thereafter to get rid of the vinegar taste and smell. Once you have cleaned all the removable parts well, it is also important for you to wipe the body gently using a wet piece of cloth or sponge. The warming plate and the outside should be wiped of all spills so they don’t burn. 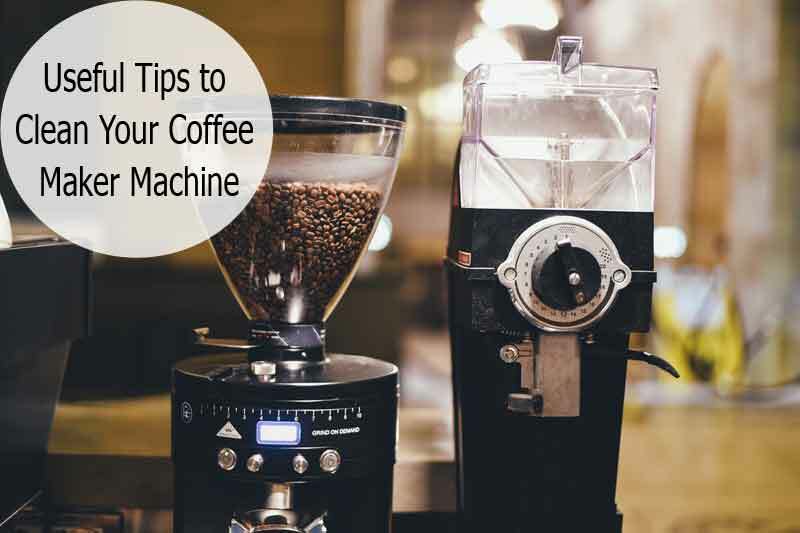 With these few tips, you will be able to maintain your coffee maker and enjoy pleasant flavor and aroma every time you brew your coffee. It is also good to check coffee maker reviews and see which ones are easy to clean and maintain.